As of January 2019, federal health officials have confirmed over 200 cases of acute flaccid myelitis (AFM) in the United States―a very rare but serious illness that can cause sudden polio-like symptoms such as weak muscles and paralysis. Most of these cases have been in children around 4 years old. The spike in the number of 2018 cases of AFM is similar to those in 2016 and 2014. However, the Centers for Disease Control and Prevention (CDC) is investigating all suspected cases of AFM. A common thread linking the cases has not been found. 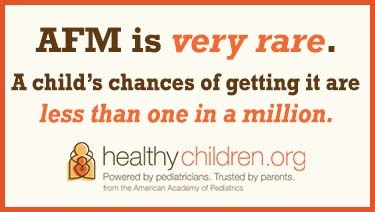 While this sounds frightening, the American Academy of Pediatrics (AAP) reminds parents that AFM is very rare. The chances of a child getting it are less than one in a million. Talk with your pediatrician if you are concerned about your child's health. Seek immediate medical care if your child has sudden weakness, loss of muscle tone, a droopy face, or difficulty swallowing or speaking. What causes acute flaccid myelitis (AFM)? There is a lot still unknown about the causes of AFM, leading many to refer to it as a "mystery illness." In 2014, there was an rise in AFM cases during an enterovirus D68 (EV-D68) outbreak. However, not all AFM patients had the enterovirus virus. Other viruses, environmental toxins and genetic disorders are also potential causes of AFM. Enteroviruses and rhinoviruses are also among the identified causes in many 2018 AFM cases. Since 2014, there have been studies looking at the long-term outcomes of AFM to better understand the disease. According to the CDC, however, there is no specific treatment for AFM. A pediatric neurologist who specializes in treating brain and spinal cord illnesses may recommend certain interventions―such as physical or occupational therapy―on a case-by-case basis. Remember, AFM is different than polio! While AFM is often called a "polio-like illness," polio is very different. Prior to the polio vaccine, which was introduced in 1955, polio was very common in the United States. It paralyzed and killed thousands of people every year. Thanks to the vaccine, polio has been eliminated in the United States. But it still occurs in other parts of the world. It would only take one person infected with polio coming from another country to bring the disease back here if we were not protected by vaccination. If the effort to eliminate the disease from the world is successful, some day we won't need polio vaccine. See 14 Diseases You Almost Forgot About Thanks to Vaccines.